Quark was born on Ferenginar, the son of Keldar and Ishka. He had a younger brother named Rom who worked as a bartender at his bar, Quark's, for some time. Like all good Ferengi children, Quark idolized his father who tended to blame all his financial failures on his domineering wife. Quark himself grew up being teased by other children because his mother did not behave like other Ferengi women and, for example, wouldn't chew his food for him and she talked to strangers. Quark grew to resent his mother, while his brother Rom, always a more compassionate sort, tended to take her side and always seemed in her good graces. Quark complained once that while Rom got a latinum tooth sharpener, he had to make do with wooden chew sticks. Quark left his home quickly upon achieving the Age of Ascension in 2351, while Rom stayed on for ten more years. His father advised him against leaving Ferenginar, noting that he could make a profit at home, but Quark ignored his advice, opting instead to follow the seventy-fifth Rule of Acquisition ("Home is where the heart is, but the stars are made of latinum"), and left Ferenginar. 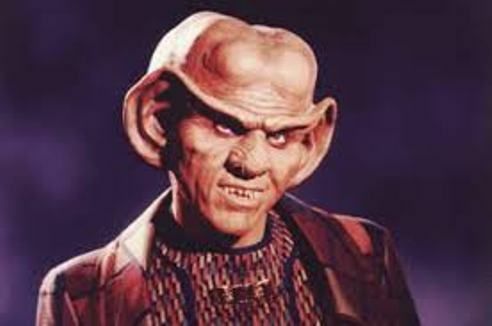 When forced many years later to confront his mother over her illegal business dealings, Quark learned that his father's failures were due to his own failings as a businessman and that if it hadn't been for his mother's prudence and business sense, the family would have gone bankrupt a long time ago. Despite Keldar's short comings with respect to profits, Ishka nonetheless stood by him as he was a wonderful husband and father. Despite their mutual animosity, Ishka noted that Quark was very much like her, both personality wise as well as with respect to having a keen eye for business, whereas Rom was more like his father: a goodhearted man without the "lobes" for business. In the mid-24th century, Quark and his cousin Barbo sold defective warp drives to the Tarahongian government. Following the discovery, Barbo was betrayed by Quark to the authorities, and Barbo was left to rot behind the bars of a detention center while Quark kept all the profits. At some point, Quark served for eight years as a cook aboard a Ferengi freighter. Despite being a cook, Quark commonly carried a disruptor pistol with him at all times, because (in Quark's words) "every member of the freighter's crew thought himself a food critic." Quark was best known as the owner and barkeep of Quark's Bar, Grill, Gaming House and Holosuite Arcade (better known simply as "Quark's"), located on the Promenade of what eventually became starbase Deep Space 9 in 2369. In this job, he was assisted by his brother Rom. While on Terok Nor during the Cardassian Occupation, Quark, though Ferengi customs frowned upon it, was somewhat sympathetic to the Bajorans, selling food to them cheaply, and on occasion, was willing to furnish alibis, for a small fee, of course. In 2365, Kira Nerys, a member of the Bajoran underground, paid Quark to cover her with an alibi. While Odo was investigating Vaatrik's murder, he entered Quark's. Despite trying to be casual and discreet, he is unable to hide his role and connection to Dukat. Asked about Kira, Quark insinuated that she was performing a sexual favor for him as an added "incentive" for him to hire her. Odo however knew more about Kira and realized that Quark was lying. Confronted with the truth, Quark admitted that Kira paid him to provide her with an alibi. Quark was considering closing his bar and leaving the station following the departure of the Cardassians and the station's occupation by the Federation. However, the station's new commander, Benjamin Sisko, coerced him into staying and keeping his bar establishment open, essentially blackmailing him with the fact that his nephew, Nog, was incarcerated aboard the station at that time. He later became involved with Rao Vantika who had taken over Bashir's body in a smuggling operation. Quark engaged in numerous shady ventures that Constable Odo routinely interrupted. For instance in 2369, Quark attempted to buy a stolen crystal through a pair of Miradorn, Ah-Kel and Ro-Kel, but he was suspiciously honest and would not pursue the deal without a bill of sale. When Croden, a visitor from the Gamma Quadrant interrupted the transaction to steal the crystal, it was revealed that Odo had been posing as a glass and was in the room; though Quark went free due to his "legal" behavior, he had in fact hired Croden to steal the jewel. In 2371 Odo caught Quark, along with Morn, attempting to stage a Vole fight, which was illegal on the station. Despite incidents such as these, Odo let the Ferengi "get away" with a transaction every now and then. Quark helped Verad and his cohorts to board the station illegally because he thought he was buying contraband goods. In reality Verad wished to steal the Dax symbiont, with Quark helping the crew stop Verad and thus save Jadzia's life by faking an injury so that he could be taken to sickbay and allow Bashir to immobilize one of Verad's team, subsequently releasing Odo from the container he'd been trapped in. Quark also ran a crooked racquetball game between O'Brien and Bashir in order to steal customers from a rival bar. He tried to make a sexual holoprogram of Kira without her permission in order to sell it to one of his best customers, named Tiron. This plan was foiled when Kira substituted Quark's head onto the image of her body. Quark also tried to cheat the Wadi, the first race that made contact from the Gamma Quadrant. When they visited his bar, he cheated them at dabo. When the Wadi found out, they made Quark play a game with some of the station's personnel as game pieces. Quark believed that it was a life and death game, but in the end it turned out to be harmless. In general, Quark was a "shade of gray" aboard the station, something to which Worf did not easily become accustomed. Just as Odo let Quark get away with things, Quark gave Odo tip-offs occasionally, if only because the Rules of Acquisition stated, "Every once in a while, declare peace. It confuses the hell out of your enemies." Worf, who was unaccustomed to Quark's nature, became frustrated that Odo did nothing while Quark was conducting a black-market deal with a Markalian criminal. The Klingon interrupted the deal to arrest them, only to find that the bag in which Quark had been holding his latinum was Odo, who had wanted to use Quark to infiltrate a larger smuggling ring and now had to settle for the middle-man due to Worf's interference. In 2369, Quark became involved with Vash. She had returned from the Gamma Quadrant where she had spent time with Q. He arranged an auction to sell off some of the items she brought back with her. One of the items was a crystal that caused a gravimetric power drain on the station. It was beamed out into space before it destroyed the station. Also in 2369, Quark became Grand Nagus of the Ferengi Alliance after the apparent death of Grand Nagus Zek. Unfortunately for him, this was only a temporary position, as Zek had faked his death in order to test his son Krax. In 2362, Quark helped Fallit Kot to hijack a shipment of Romulan ale. Kot was arrested and sentenced to eight years in a Romulan prison. When he returned to the station he attempted to kill Quark, but later entered into a business deal with him. The deal turned bad when Fallit Kot killed one of the partners and kidnapped Melora Pazlar and Jadzia Dax, holding them as hostages. When Major Kira asked Quark to hire the Bajoran musician Varani in the hope that Varani's music would help her people recuperate in the wake of the Cardassian Occupation, profits declined sharply. Mesmerized by Varani's beautiful playing, the customers in Quark's Bar stopped gambling, eating and drinking as they enjoyed the soothing melodies. Quark panicked and got hold of Kira as soon as possible; although she made him keep his promise to hire Varani for a full month, Kira asked the man to play something more lively, which met with Quark's approval. That same year, the Skrreea refugees came aboard Deep Space 9 in droves, which Quark found thoroughly distasteful. On top of not buying anything, the former residents of the Gamma Quadrant flaked and left dead skin all over his bar; tensions came to a head when his nephew Nog provoked a Skrreean boy into a fight. Quark was more than happy to see the Skrreea leave the station several days later. In 2370, he completed the first trade negotiation with the Dominion. With the help of Pel, a female Ferengi disguised as a male, he tried to buy wine from the Dosi. It was illegal for Ferengi females to do business, and Quark almost got into trouble with the Grand Nagus. He briefly became romantically involved with Pel. Quark was almost murdered after he retrieved a list of collaborators from the station for a Bajoran woman named Pallra. This incident reopened a five-year old murder case. In 2370, Quark, via a communication from Deep Space 9 to the USS Enterprise-D, provided Commander William T. Riker with the location of the Duras sisters, Lursa and B'Etor. While communicating with Riker, Quark voided his winnings from playing dabo at his bar. Not only was Quark the first to deal with the Dominion via the wine sale with the Dosi, he, along with Benjamin Sisko, was one of the first to meet the soldiers of the Dominion. During a camping trip in the Gamma Quadrant, he and Sisko were captured by the Jem'Hadar. They were rescued along with an alien named Eris. After returning to the station, it was Quark who found out that Eris, a Vorta, was an agent of the Dominion (Albeit because he had been studying a device that she claimed had been blocking her telekinetic abilities in the hopes of duplicating and selling it only to determine that the device didn't actually do anything). Quark also tried to con Ensign Harry Kim into buying worthless Lobi crystals when he visited Quark's in 2371 - nearly blackmailing him into buying the entire set by threatening diplomatic consequences when the ensign mentioned having been warned about Ferengi as a Starfleet Academy cadet - but Kim was saved from his scam by Tom Paris, who, once the two were out of earshot, expressed surprise that Kim had apparently failed to heed the warnings about Ferengi issued at the Academy. Quark had many dealings with Grand Nagus Zek and Brunt, the Ferengi Commerce Authority's chief liquidator. Quark helped Zek regain his senses after he was affected by the Prophets and re-wrote the Ferengi Rules of Acquisition. The new rules were in direct contrast to the old ones that emphasized greed. Quark was able to convince the Prophets to change Zek back. Later that year, he met Brunt, who was investigating Ishka, Quark's mother, who violated Ferengi law by earning profit. Quark got his mother out of trouble when she agreed to give back the profits, or so Quark and Brunt thought, for she kept two thirds. He later helped disarm a Jem'Hadar torpedo that was stuck in the hull of the USS Defiant, saving the ship from destruction. Brunt showed up to make Quark's life miserable in 2372 when Quark's employees, led by Rom, formed a union. The employees refused to dissolve the union even after Brunt threatened them. As a result, Brunt had his Nausicaan thugs beat Quark to show the employees what could happen to them. Quark secretly conceded to the demands of the workers and they in turn dissolved the union. Later that year, Quark was told he had a fatal illness. He auctioned off his body parts to the highest bidder, not knowing that it was Brunt. When he found out that it was a mistake and he did not have the illness, Brunt still insisted that he keep the contract by killing himself or Brunt would revoke Quark's business license for breaking the contract and a supreme Ferengi law and he would not be allowed to earn profits. Quark ultimately broke the contact and Brunt confiscated everything in his bar. Quark was able to reopen with the help of his friends on the station. In return for restoring his license, Quark tried to break up his mother and Zek, who had fallen in love. He later learned that Zek was becoming forgetful and Ishka had been helping him. Brunt wanted the relationship over with so that Zek could not function and Brunt could become Nagus. Once again, Quark foiled Brunt's grab at power, but he kept his license. In 2374, Brunt again tried to become Nagus. He had Zek deposed because Zek was promoting female rights. Quark was surgically altered to temporarily become female and as Lumba, she convinced Nilva, one of the most influential Ferengi, to support Zek, and was returned to power. As the resident bartender, Quark concocted new beverages from time to time. One of his less successful creations was "Quarktajino", a self-named version of raktajino sans the caffeine. He created the drink at the request of Chief O'Brien, who wanted Major Kira to stop drinking caffeinated beverages while she carried his child. Both the chief and the major thought the drink tasted horrible, and O'Brien refused to pay for it. Quark, his brother Rom and his nephew Nog were once transported in time to Earth of 1947. This became known in Earth history as the Roswell Incident. Quark became involved with an arms dealer named Hagath when his cousin Gaila offered him a job with Hagath when Gaila retired from the business. Although Quark's new role helped him cope with his recent financial issues, he eventually helped break up the arms ring when he was horrified to realize that money was being made by people's deaths, coupled with the realization that he had lost any of his allies among the station's crew who might have supported him due to their disgust at his new role. Quark intentionally sabotaged an arms deal for the Regent of Palamar, which ended up getting him killed, thereby saving approximately 28 million lives. After the Dominion captured Deep Space 9, Quark remained on the station and continued to run the bar; pleased at the flow of income that the Dominion occupation of DS9 had brought his business. When Kira challenged him on this point, Quark, showing a rarely seen softer side to his personality, responded honestly that he missed the Starfleet personnel just like she did but, at least the Dominion occupation was nowhere near as brutal as the previous Cardassian occupation had been. Quark was instrumental in turning the tide against the Dominion. Quark cunningly obtained secret information from Damar by sharing a bottle of Kanar with him. Quark learned that Damar was bringing down the minefield. He also discovered how and when it was coming down, which he quickly informed the Deep Space 9 resistance cell. It was Quark who suggested they get a message out to Starfleet. Together, they figured out a way to get a secret message to Captain Sisko by using Morn as the carrier. Sisko then formulated Operation Return, thereby saving the Alpha Quadrant. He also aided in helping the Defiant retake the station, when he freed Kira and Rom from the holding cells during the attack and they were able to deactivate the weapons on the station. Later he led a group of Ferengi in rescuing Ishka from the Dominion. Quark got involved with Morn's former associates, thinking Morn was dead, and went looking for the latinum they had stolen in a heist with Morn. He also participated on Sisko's baseball team when they played against Sisko's Vulcan rival on the holosuite. He later accompanied Worf on a mission to destroy the Dominion shipyards so that Jadzia could enter Sto-vo-kor. Quark's moment of truth came in 2375 during the siege of AR-558. During a savage Jem'Hadar attack, he saved Nog, who was wounded, by killing a Jem'Hadar who had entered into the infirmary. Later that year, Quark was visited by Grand Nagus Zek on Deep Space 9, thinking he would be named his successor. Instead, Rom became Nagus. At the end of the war he remained on the station. Colonel Kira, who assumed command, told Quark she would watch his every move. Quark stated that the more things change, the more they stay the same. In 2376, after the Dominion War, Quark found himself developing an attraction to the station's new security chief Ro Laren. In April the station was attacked by a group of Jem'Hadar and Ro injured, falling from the stairs in his bar. Quark took the opportunity to play the hero and took her to the infirmary. He later sent Ro a bunch of Argelian flowers. Later that year Quark represented the Orion Syndicate in negotiations with the race claiming to be the ancient Iconians during the Gateways Crisis. Unbeknownst to the Orions, Quark was actually working with Bajoran security officer, Ro Laren, who succeeded in taking down the organization of the Orion criminal, Malic. Quark and Ro freed an Orion slave girl named Treir from servitude to Malic and she accepted Quark's offer of a job as a dabo girl. In September of 2376, as Bajor prepared to join the United Federation of Planets, Quark was once again preparing to leave, as the Federation's economy was nominally money-less, leaving Quark with few options to obtain profit in the Bajoran system. Luckily for Quark, his brother Rom was the new Grand Nagus of the Ferengi Alliance. Rom opened diplomatic relations with Bajoran First Minister Asarem, and appointed Quark to be Ferenginar's Ambassador to Bajor, with his bar being sovereign Ferengi territory, allowing him to continue his business. He returned to Ferenginar soon after to attend the birth of his niece, Bena, daughter of Rom and his Bajoran wife, Leeta. While he was there, he helped Rom fight off an attempt to have him removed from his Nagus-hood by Ferengi congressman, former FCA agent, Brunt.